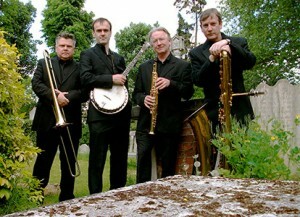 Our New Orleans Funeral Band, a jazz band of course, is based in London but available across the country. It does this by utilising talented local musicians whenever possible thus keeping down expenses. Ten years ago the band was formed in response to many requests for a traditional New Orleans style funeral. Many clients have referred to the 1970’s James Bond Film, Live and Let Die, which commences with a New Orleans Funeral Jazz Band playing for the deceased and the mourners through the streets of the Crescent City. We have come to the conclusion that most of the deceased who have asked for a New Orleans Funeral Jazz Band first saw their first New Orleans Brass Band when watching this film! ”The New Orleans Funeral Band gave my brother (aged 87 years) the best send off ever imagined at his funeral celebration yesterday. Jeff’s Jazz Band arrived well before time, met immediate family, played before, during and after the service. We went for an upbeat celebration which the Band achieved to perfection. The whole gathering were saying it was the best funeral ever and loved the style and the manner in which Jeff and his Band conducted themselves. If you have ever fancied a real ‘send off’ which will not upset the older generation (imagine the age of some of the guests) and will take the pain out of a funeral then go for it with Jeff and his Band. If you’re marking the passing of a loved one with a New Orleans Jazz Band then we can assure you that we’re more experienced than most to take you through the process. Do you want the band to meet at the deceased’s house and walk the cortege down the road? Then arrive at the cemetery gates and march everyone up and in to the service? We can do this. Whilst everyone is in the chapel, we can either wait until everyone comes out of the service, or we can participate with a hymn or two and maybe a tune whilst people reflect. Alternatively, we wait until everyone comes out from the chapel and play for everyone outside. And then we often get asked to go back to the wake. 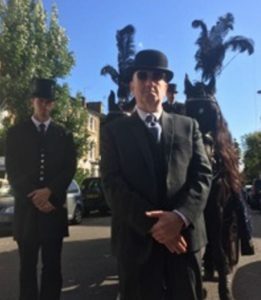 Normally this is usually held at a local hotel or pub We will play for some time whilst the mourners, the cortege, friends and family of the deceased, talk about their friend who has passed away, relate stories and generally help lighten the mood. Contact us here for a quote, or phone us on the number at the top of our home page here. Usually four up to six musicians work best, depending on the number of people expected to attend the funeral. We choose music that is suitable for church goers or secular music. Everyones taste in music is different. The New Orleans Funeral Band is happy to oblige all denominations and non denominational types too. More information on New Orleans Street Bands and New Orleans funeral band hire here. Funeral Jazz Band Hire everybody. Funeral Marshall. We get requests from time to time for the addition of a Funeral Marshall. The Marshall adds a certain “tone” to the proceedings, can act as liaison with the funeral director and the band on the day and really add to the authenticity of the New Orleans Experience. Caribbean Funerals, Music, Band, Jazz and Hymns. Here in London, just like other big cities in the UK, we have a sizeable West Indian Community. We have played for many West Indian Funerals and have enormous experience in working with the West Indian tradition of burying the deceased with family and friends taking turns to put their loved one to rest by using a shovel to fill in the grave. At this point the music for the West Indian Funeral is of prime importance. Our New Orleans Band plays old Hymns like “Onward Christian Soldiers” “The Lord is my Shepherd” “How Great Thou Art” as well as songs such as “Jamaican Farewell”. The band is more than willing to travel, as explained in our F.A.Q’s. More info on our jazz band hire page. And here is a fantastic website explaining the funeral from the New Orleans perspective. New Orleans Funeral Band London based. Available UK wide. 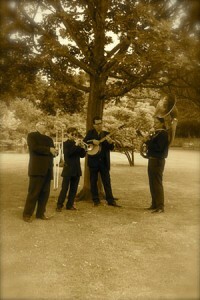 Information on Street Band Hire and Street Band Hire London is here.